I just finished reading The Basketball Diaries by Jim Carroll. If you are not familiar with this little volume, it is Jim's true-life diaries about growing up on the streets of New York City in the early 60's, while learning to shoot heroin as well as hoops. The book gradually passes from his 13th year when basketball was his main thing, until 16 when smack had completely taken over -- his life, his perception, his focus. In the end he is sticking a knife under the throats of 6am Central Park dogwalkers for fix money. The basketball diaries give way to the needle diaries of a junkie consumed with the hunger of his addiction. Last June my wife and I went up to Taos for the annual Taos Poetry Circus. Jim was a featured reader there. 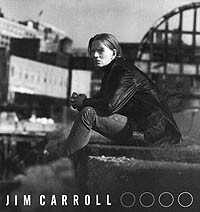 I had had no experience of Jim Carroll's poetry, words or music until then. He read pieces from Void of Course, the then yet unreleased and most recent of his books of poetry. It was published last fall. He's now 48 or so, though his years of heroin addiction do not show, except in his eyes. In my mind he could've passed for 35 or even younger. Jim is clean now. I don't know exactly when he kicked, but then again, I don't know if there really are any ex-junkies. They may not cook the powder for a hit any more, but I don't think they ever lose that junkie-stare -- that hunger -- it never really leaves their eyes. The hunger stays with them, they only learn to live without satisfying it. Having finally obtained Basketball Diaries from the Albuquerque Public Library in January having reserved it months earlier, I began to read Jim Carroll's tales of biddy basketball leagues interlaced with his early and various drug experiences. Having seen him recently, I became more interested in where he is now poetically, so I made my first purchase on amazon.com and ordered Void of Course. Two writers -- one the older former addict, one the younger addict-in-formation -- two different writers but without a doubt the same muse. In between these stages he was a rock star for a while. You might remember a song called "People Who Died". It's very important to the punk generation -- circa 1980. There is certainly no one on Earth who could relate to Kurt's situation better than Jim. Both famous rockers. Both heroin junkies. Though these conditions are in Jim's past. The guitar claws kept tightening, I guess, on your heart stem. We never stop paying the monkey -- any of us. We all have our monkeys. Heroin addiction is just an extreme, vicious, brutal and base form of the monkey. Our monkey is our hunger -- whatever we may hunger for. Art or love or belonging or success or freedom -- or in its least extreme, simple survival -- these are all hungers. Only a few of us really try to feed our monkey. Some don't try at all but the monkey is still there. Your hunger is your reason for living, without which you die. I read Basketball Diaries over a period of a couple of weeks during the bus ride home from work. About 10-15 pages a day was all I wanted. Junkie stories are not what you would call uplifting, though the book isn't that heavy. Teenage writers aren't too gut-wrenching in their descriptions, and there are actually a number of funny stories in the book. Walking home from the bus stop after reading about Jim degenerating to street mugger, I was thinking that I can't imagine that kind of need. (I've had my drug experiences and been part of that subculture, though in my life I've never used a needle, nor even seen heroin.) But it dawned on me that the artist's hunger to create is like that hunger, or it needs to be, to be effective. Based on Jim's words to Kurt, his artistic hunger was actually greater than his hunger for smack, one overtaking and subduing the other. Your monkey will kill you if you don't feed it. Jim has taught us to remember that it's up to us how we feed it, what we feed it with, and most importantly, what name we give it.